As iPad continues to be a steadfast learning device for K-12 education, finding the right way to manage iOS devices can be as important as the technology itself. 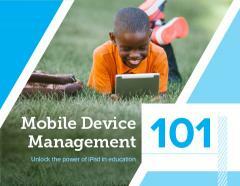 In this e-book, we’ll educate you on the basics of mobile device management (MDM) and explain how you can maximize your education technology purchases. Get the answers you need to get more out of the most trusted platform for IT and educators.